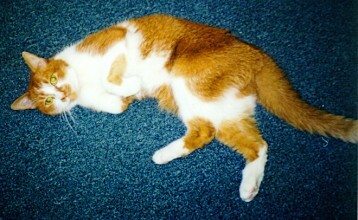 Cuddles works for the Uranium Capital Nursery School in Elliot Lake, Ontario, in Canada. He started when he was only 6 weeks old. 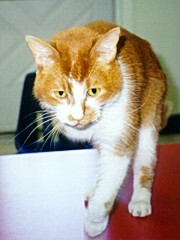 His picture and story were sent in by Katherine Croxson who writes, "He was a perfect addition to the school, because he is a "special needs" cat, and the school has a "special needs" program. Cuddles was born with only three legs but this does not stop him from doing all the things normal cats do. The fact that he jumps and plays gives the children the courage and self-confidence to try activities too. Often a child will say, 'Cuddles can do all those things, and so can I.'" She adds that he loves to be petted and cuddled and will often jump into a child's lap when they are working at a table. He is well loved by everyone in the school, and couldn't be happier or healthier. 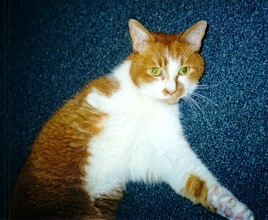 Note: Cuddles died of kidney disease in July 1998 and everyone who knew and loved him misses him very much. The children especially miss him and it will be some time before another cat is sought for the Nursery School.